Hotel Stage is a new boutique hotel conveniently located in the historic heart of Kowloon, Hong Kong taking its guests on a journey through the lens of history, culture and art. Hotel Stage's sophisticated design cocoons guests within the city's bustling cultural centre. Yau Ma Tei is a living time capsule of the old Hong Kong. The district is home to many of Hong Kong's family-owned traditional shops that have been in business for generations -- from Chinese hand embroidery bridal shops, Chinese herbal medicine apothecaries, to vintage teahouses and a theatre that was once a setting for Hong Kong's vibrant film industry and now the stage for small-scale Cantonese opera shows. Designed to serve the curious traveller, this stylish property takes its guests on a neighbourhood journey through the lens of history, culture and art. 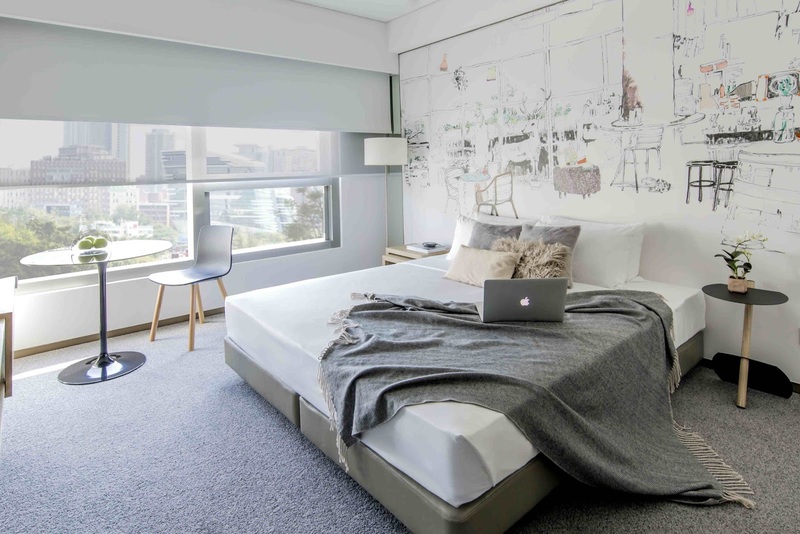 The interiors are designed as a canvas that connects the guests with Hong Kong's artistic community through a carefully curated, inspiring collection of art and a varied programme of cultural events. Modern furnishings create a warm and comfortable contemporary environment. The 97 guestrooms and suites showcase a well thought-out smart design aesthetic which marries a sense of place and space with practical design features - all accomplished with a sense of flair. Oversized windows provide abundant natural light and sweeping views of local heritage landmarks and classic high rises. Rooms are equipped with high-speed multimedia connectivity devices and deluxe amenities. Suites feature a separate living room with a sofa and comfortable touches. Meanwhile, the Art Rooms display contemporary works from emerging local artists in homage to the neighbourhood. Club and Suite guests can enjoy 24-hour exclusive access to the cosy and tranquil Library Lounge -- a perfect place to relax or browse through the extensive library of collectible books. Furnished like a living room, guests can help themselves to light refreshments throughout the day. Hotel Stage's all-day-dining Italian restaurant, Kitchen Savvy, is tastefully designed with an open kitchen concept. It is conveniently divided into three zones, including a living room and lounge, an intimate dining area and a communal dining space for entertaining friends or business partners. The smart casual eatery combines a European-inspired menu with a creative Asian flair focusing on fresh seasonal ingredients. Hotel Stage offers meeting and function facilities for groups up to 150 people. Floor-to-ceiling windows offer natural lighting and views of iconic Kowloon landmarks. The rooms feature high speed, multi-media connectivity, LCD projectors, video, multi-TV systems and a range of the latest audio-visual equipment for meetings and conferences. Hotel Stage also offers Day Studios for those who are looking for a creative and inspiring space to host masterclasses, celebratory events, and business or private meetings. Outfitted with modern meeting amenities, it is also a functional gallery displaying selected multi-media, multi-genre art installations. "Hotel Stage is a landmark and community hub with our staff serving as stage managers of our guests' experiences. We have created a setting for local artists, performers and artisans to showcase the soul of the city," said James Hung, General Manager of Hotel Stage. "Here, the curious traveler can discover a deep connection with the local community and be inspired by our unique ambience of living artistry."